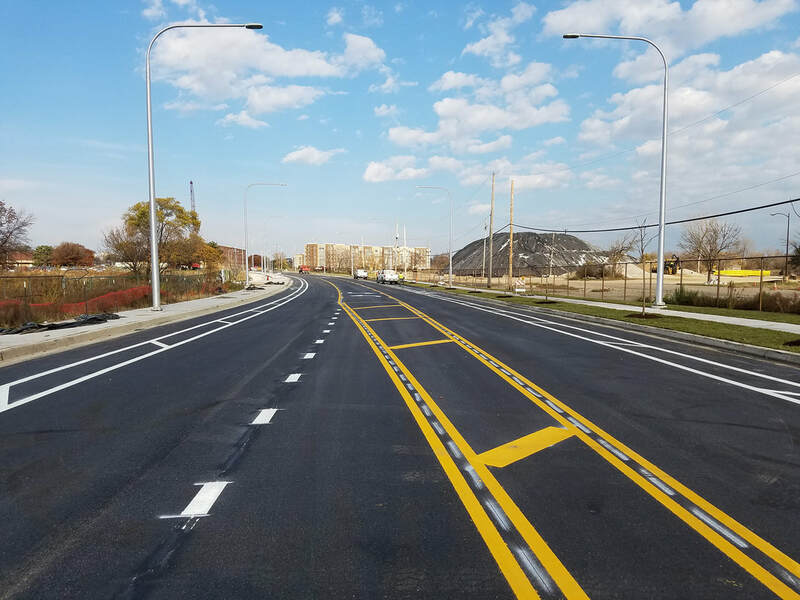 The project: a $4.1 million, one-mile, roadway reconstruction project to widen the roadway for two, 10-foot road lanes, bike lanes in both directions and a painted median. 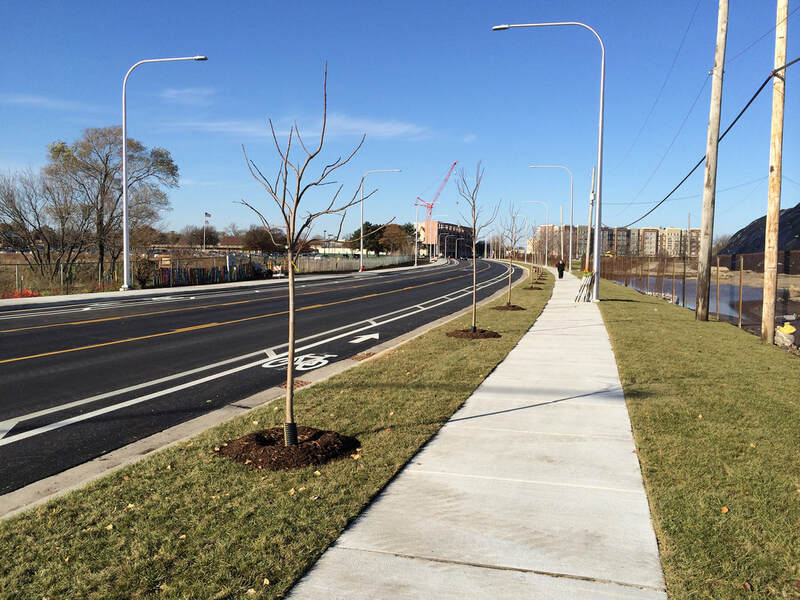 Sidewalks were included on both sides along with curb & gutter, and a closed drainage system that provides storm water run-off retention to mitigate flooding. New LED street lighting was installed and traffic signal upgrades were made. Conventional landscaping, as well as, native prairie grass was planted. Our story: when we first visited the project sight, we saw a long, two-lane roadway with gravel shoulders. The roadway was lacking adequate drainage making it susceptible to frequent flooding during heavy rainfalls. We spoke with local area business owners and came to realize this section of roadway, which was first built during the Works Progress Administration (WPA) era in the late 1930’s, was long overdue for rehabilitation. Hopes for revitalizing the grounds of the former Chicago-Read Mental Health Center area have been 25-years in the making since establishing the TIF district in 1991. Oak Park Avenue, located in the City of Chicago, is at the center of a 225-acre TIF which was created to facilitate its transfer from public land to largely private ownership and to prepare it for a mix of uses. Priorities for the TIF district are continued institutional uses, new industrial projects, commercial projects, and housing development. Funds are intended to facilitate land acquisition efforts, demolition and site preparation costs, new construction, utility improvements, and a variety of street upgrades. 1890. This new information prompted us to research and review historical records of the cemetery, which were very limited, and no definite records were found to indicate the cemetery was actually under Oak Park Avenue. Jamie reached out to the Chicago Department of Transportation about our concerns and recommended that further investigations be done. The City agreed too and construction was suspended. The City brought in an archeologist and a cemetery specialist to lead the investigation. Through extensive coordination with IDOT, the Illinois Historic Preservation Agency, utilities, adjacent property owners, and the contractor, a respectful and solemn investigation was undertaken which did reveal a cemetery had indeed been utilized. Our next step was to conduct surveys to determine the limits of the internments. We were able to find old Cook County mapping which identified the eastern limits of the cemetery that had a straight alignment of Oak Park Avenue from the south. The north and south limits of the cemetery were based on mapped offsets parallel to survey section lines. Having this information, we set flagging in the field to provide a visual boundary and thru small exploratory digs on either side of these lines we were able to verify that no interments were outside of the determined cemetery limits. 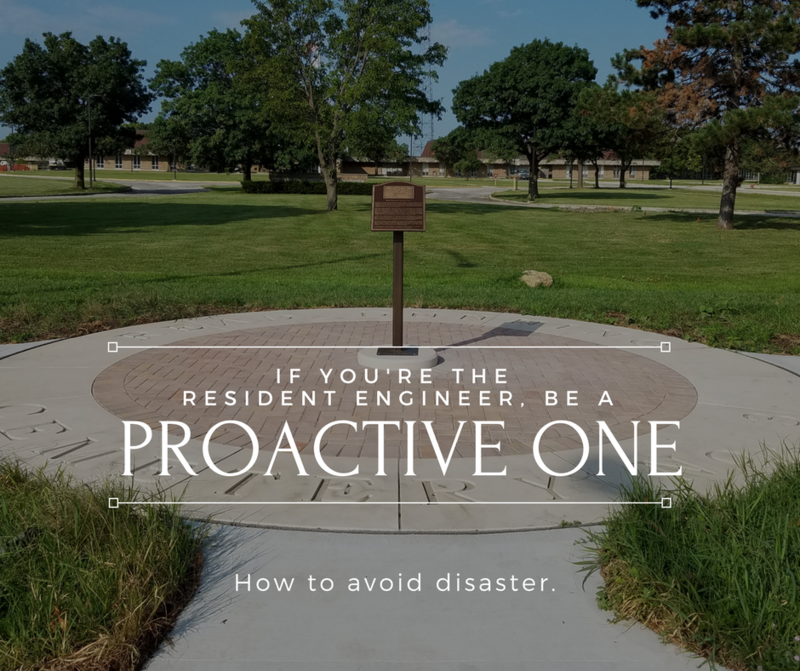 With this information, we worked with CDOT and the design engineer to develop an avoidance plan which included creating a permanent utility easement around the cemetery allowing all utilities and drainage infrastructure to be installed to mitigate flooding without disturbing the cemetery. Roadway construction resumed in the Spring of 2016. The proposed roadway profile was raised with careful attention to the construction activities and existing pavement removal not extending into the archeological zone below ground. As this successful project neared completion, through the proactive efforts of our Resident Engineer, we realized this forgotten cemetery must never be forgotten again. Jamie once again called on the city’s archeologist and the cemetery specialist to help in designing a memorial to the forgotten souls. Jamie presented several sketches for the memorial. In the end, a 20-foot diameter brick paver design with a concrete ribbon edging was agreed upon. The precast concrete edging panels has Read Dunning Cemetery No. 3 etched into the concrete. At the center of the memorial, a new bronze monument stands with a picture of the cemetery from the early 1900’s that Jamie discovered hanging on the wall at the Dunning hospital. The monument and memorial now stand at the site of the cemetery, alongside Oak Park Avenue, commemorating “Read Dunning Cemetery No. 3” assuring that this property and those interred there will never be forgotten again.